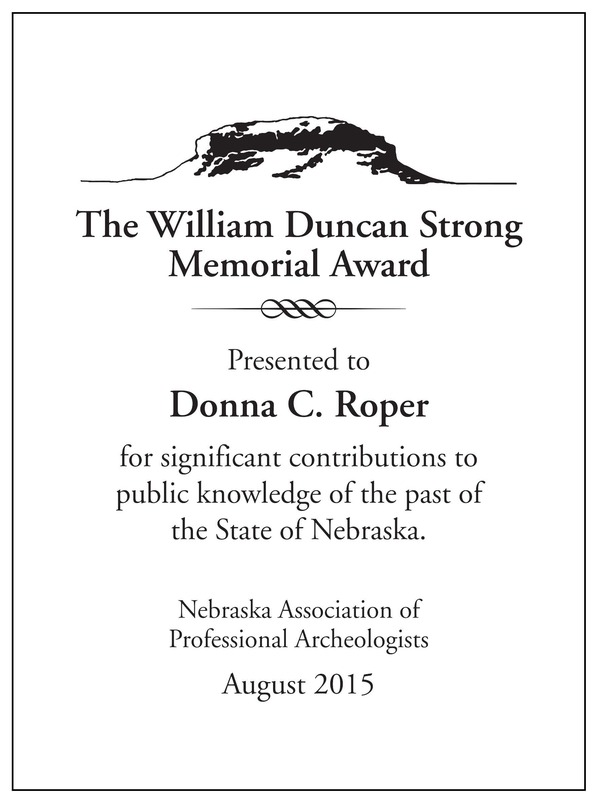 The Nebraska Association of Professional Archaeologists is pleased to announce that Donna C. Roper has been presented with the William Duncan Strong Memorial Award in honor of her outstanding contributions to the field of Nebraska Archaeology. “At the 2013 Plains Conference in Colorado, banquet speaker Doug Bamforth was discussing some idiosyncratic aspect of Plains Village chronology and remarked “and if Donna is right, and Donna is always right…” Bamforth’s quip is clear testimony to just how important Donna Roper has been to Central Great Plains archeology. Donna is from Oneonta, NY (no, that’s not Oneota) where she received her BA in History followed by an MA in Anthropology from the University of Indiana and a Ph.D. in Anthropology from the University of Missouri-Columbia in 1975. She stayed on in Columbia until 1980 before working for Gilbert-Commonwealth out of Michigan until 1991. Since 1992, Donna has been in Manhattan, Kansas as Research Associate Professor with Kansas State University and also working as a private consultant and independent researcher. She has been a member of NAPA since its early days and served in various capacities on the Board of Directors and as long time co-editor of Central Plains Archeology. Most recently, Roper has been instrumental in forging closer ties between NAPA and PAK (Professional Archaeologists of Kansas). Roper’s depth and breadth of archeological research in Kansas, Nebraska, and surrounding states is impressive and her publication record far exceeds any of our colleagues in the region. An estimate of Donna’s publications to date include: 2 edited books, 8 book chapters, 62 articles in professional journals (including American Antiquity, American Anthropologist, Plains Anthropologist, Central Plains Archeology, Kansas Anthropologist, and Current Archaeology in Kansas), 8 book reviews, 27 major CRM contract monographs, and nearly 200 shorter compliance reports. Much of her compliance work over the years has been in the Republican River basin for the Kansas-Nebraska Office of the US Bureau of Reclamation. 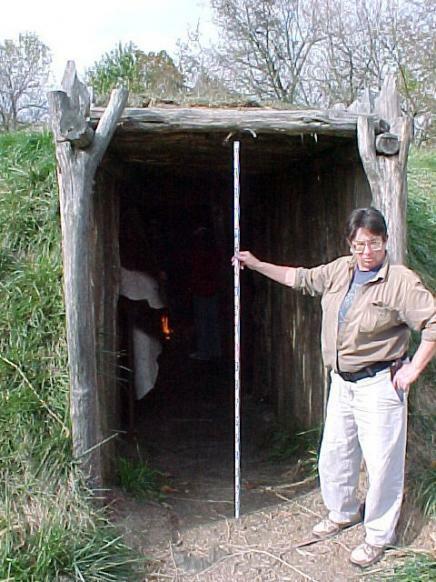 The extent of her publication record, in addition to her involvement with public programs including the Kansas Archeology Training Program, Becoming an Outdoors Woman, and public presentations throughout the region, clearly demonstrate the importance she has placed on sharing her knowledge and passion for archeology with her colleagues and the public alike. Although she is known for work in many facets of archeology, her efforts with the Plains Village period is particularly notable. Her contributions stem from new excavations conducted under her direction, examination of many curated museum collections, rigorous attendance and participation at conferences, keeping abreast of the literature, and perhaps most importantly engaging in serious thinking outside the box. Her most outstanding achievements are a sharper understanding of the Central Plains tradition and post-contact Caddoan (Pawnee in particular) villagers. Specifically, Donna has contributed great detail and understanding of Pawnee ancestry, Central Plains tradition origins and demise, earthlodge construction and use, hunting expeditions and hunting camps, use of ethnohistorical information, and pots and potters. Her most recent research passion has been mass re-analysis of radiocarbon dates and development of dating criteria for building a more accurate Central Plains tradition chronology. On behalf of NAPA, thank you Donna for everything you have contributed to Nebraska Archaeology, and the field of Archaeology as a whole! ← Governor Pete Ricketts proclaims September 2015 as Nebraska Archaeology Month!